John Seleznev, who I am entirely unfamiliar with, released Vistas just a few days ago on December 11th, 2018. 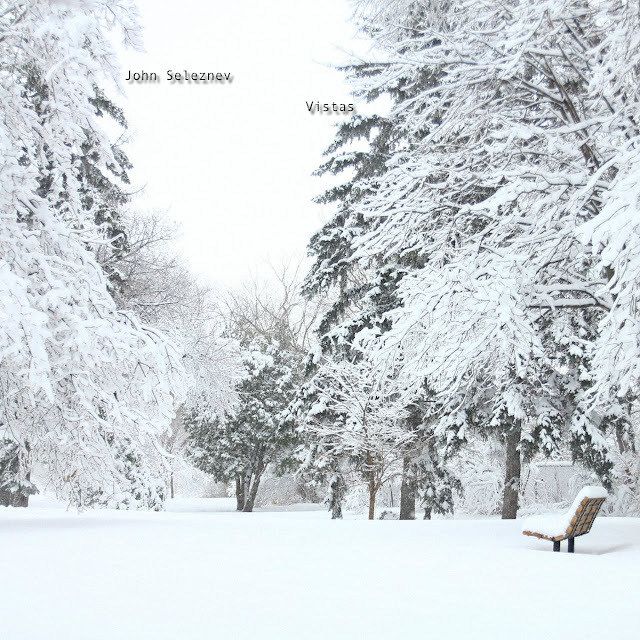 The album seems especially appropriate for winter, or it would be if it any snow had actually fallen by now. Technically winter will not begin until December 21st, so there is still time. The album is here now, and we can pretend. The cover art to Vistas is no masterpiece. It does the job, but it looks very middle-of-the-road. I like the details of the trees, and I appreciate the monochromatic design. The bench in the corner, presumably included to create a solitary and calm feel, hurts the overall color scheme though and draws the eye away from the landscape. The text is very small and includes an awkward drop shadow, especially with the bleak, white sky behind it. Small changes would have taken this cover to higher places. Vistas begins with “Wavy Ground”. The track is composed of echoing, choral guitars, a scan over a landscape. This could be the musick in a nature documentary. Various layers come thru including piano and a simple beat. The icy chill descends on us as we enter the middle of the song. The drums are kind of cheesy, but I kind of like them, making the track seem somewhat more playful and fun to an otherwise meditative work. “Kosciuszko” begins with small chimes and turns into something that nears trip-hop with a cool beat, shimmering synth pads composed of falling snow, and a small line of conifer trees on xylophone (or similar percussion). “Kiandra”, the third track on the album, opens with a watery bass before adding a soft choir from another aqueous star. Gentle guitaring drifts through the sound. “Fen” changes it up, going darker and starting with a simple, compressed beat like somebody playing a cardboard box. It almost gets repetitive with the choir sound used previously, but the chimes in this track, which also may have been used previously, make the whole of the piece work decently overall. This is still the least interesting track to me, and the break towards the end really hurts it overall. The final track is “Onsen”, the word for a Japanese bath. It has a drippy sound and thudding drums. Starting almost creepy, the track makes a cyberpunk turn with a keyboard line and bass throb; the shot pans out over the fence and we see that it’s a replica of rural Japan in a vast neon metropolis. The choral tones that mix with the lost voices of static give me chills in their horror of neo-consumerist dystopia. This is a great track, though I wish, again, that it did not take a break towards the end. Despite its shortcomings, Vistas is not a bad release at all. While "Fen" may falter and the pieces may reference the same structures throughout, the kindred atmospheres are not homogenous and work as a whole to create a larger world. The standout track, "Onsen" pushes the EP beyond where it may have gone with the remainder alone, bringing a statement and vision to my mind that says something totally new and vivid. On the edge of the world, Vistas receives a Good.